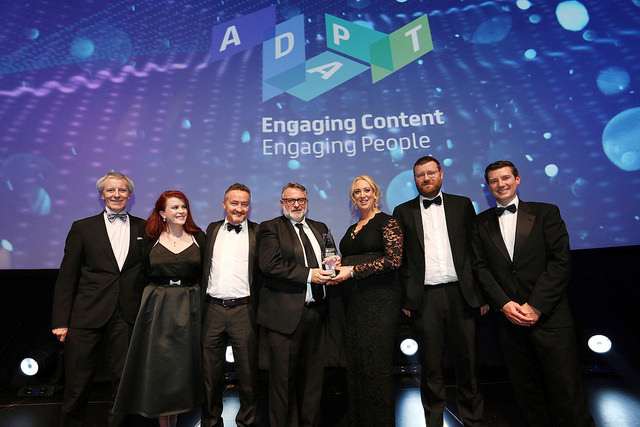 The ADAPT Centre has scooped an award for an advert creation system that has the potential to transform the advertising industry and provide a personalised user-experience for all consumers. The digital content technology centre, a SFI Research Centre, was named winner of the ‘Outstanding Academic Achievement of the Year’ category at the 26th Annual Technology Ireland Industry Awards on Friday 23rd November, beating off stiff competition. Above: Representatives from ADAPT receive their award. The ADAPT Centre is the global centre of excellence for digital content technology. Funded by Science Foundation Ireland, ADAPT is led out of Trinity College Dublin and incorporates the world-class expertise of researchers at Dublin City University, University College Dublin and Dublin Institute of Technology. ADAPT’s activities encompass research, training at graduate and post-graduate level, and technology transfer activities in the area of digital content including Artificial Intelligence, virtual and augmented reality, multimedia information management and extraction, natural language processing and understanding, social media analysis, multimodal interaction, image and video processing, human-agent interaction, cognitive systems, deep learning and machine learning, amongst others. ADAPT’s researchers are focused on pushing the boundaries of what is possible to develop next-generation digital technologies that enhance human ability by enabling seamless tech-mediated interaction, communication and engagement. Technology Ireland is the technology sector association of Ibec. Representing over 200 members, we advocate on behalf of Ireland’s indigenous and foreign direct investment (FDI) technology companies to Government and policy makers. We make sure Ireland is the most competitive location in the world to grow successful technology businesses. We also develop our own initiatives and services to help member companies prosper. Our mission is to make Ireland a global technology powerhouse.